(NaturalNews) The truth is finally coming out about the Ebola crisis and its real purpose, which appears to be to sell more vaccines. As it turns out, the drug industry has had Ebola vaccines in the pipeline for years, but it has been waiting for just the right time to release them for maximum profits, unveiling just a little bit more about the true agenda behind all the current Ebola fear-mongering. Nearly a decade ago, researchers from Canada and the U.S. collaborated on the development of a vaccine for Ebola, which they tested on monkeys. Based on these tests, the vaccine was found to be 100 percent effective, and the results were published in the well respected journal Nature Medicine. It was assumed at the time that the vaccine would be released commercially to stop the disease's spread in places like West Africa -- but it wasn't. The reason is that there was no profit to be made in releasing the vaccine at that time. Instead, Big Pharma decided to shelve the project until a later date when demand for the vaccine was higher, and more money could be made. "Its development stalled in part because Ebola is rare and until now outbreaks had infected only a few hundred people at a time," explains The Boston Globe. "Most drug companies have resisted spending the enormous sums needed to develop products useful mostly to countries with little ability to pay." 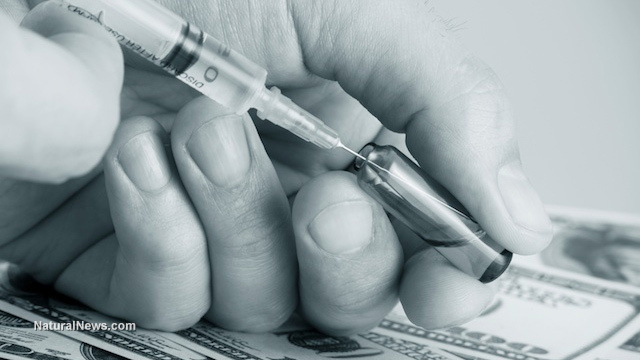 In a sinister display of raw capitalism, the vaccine industry deliberately avoided testing its Ebola vaccine until a later time when wealthy nations such as the U.S. demand it. With this time quickly approaching -- roughly 5,000 people have died from Ebola in West Africa, and several American nurses have also contracted the disease -- the vaccine is only just now being tested on humans. "There's never been a big market for Ebola vaccines," said Thomas W. Geisbert, an Ebola expert from the University of Texas Medical Branch in Galveston, as quoted by The New York Times (NYT). Geisbert helped in the development of the Ebola vaccine. "So big pharma, who are they going to sell it to? It takes a crisis sometimes to get people talking. 'O.K. We've got to do something here.'" Well, the convenient crisis is now here, and mass-production of Ebola vaccines will soon be here. The World Health Organization (WHO) says hundreds of thousands of Ebola vaccines will be available for public consumption by mid-2015, and lightning-speed human trials have already begun in preparation for their launch. Experimental vaccines are already being given to health workers in Liberia, with those in Sierra Leone next on the list. The trial is claimed to be double-blind and placebo-controlled, but those in the placebo group will be receiving vaccines for other diseases such as measles. Neither the participants nor the doctors will know who is receiving which vaccines. "The companies have committed to ramp up to millions of doses to be available in 2015, with hundreds of thousands ready in the first half of the year," stated WHO Assistant General-Director Dr. Marie Paule Kieny, as quoted by The Guardian. "Mass vaccination -- if any of the vaccines work -- will not happen before next June at the earliest," The Guardian paraphrased her saying.